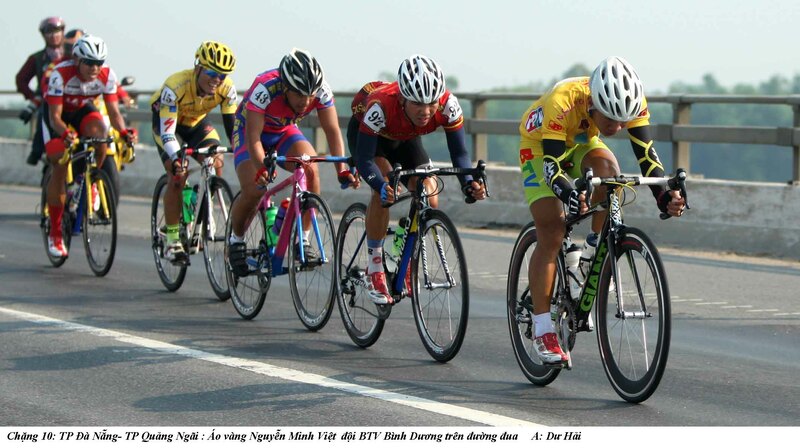 HCM CITY (VNS) — While not winning the 11th stage of the 27th HCM City Television Cycling Cup yesterday, young cyclist Nguyen Minh Viet of BTV Binh Duong held onto his yellow jersey. Viet won the jersey for the best overall time of 29:25.51 after 11 stages. Hanoian Quang Van Cuong and Nguyen Hoang Giang of An Giang's Gao Hat Ngoc Troi were runners-up. The 180km stage winner from Quang Ngai to Quy Nhon City was Le Van Dong of VTV Can Tho with in a time of 4:43.31, followed by Ho Hoang Son of Thanh Son Hoa Nong and Le Anh Dung of Ha Noi. Le Van Duan of VUS-HCM City managed to retain the green jersey as best sprinter with 77 points. In the team race, Gao Hat Ngoc Troi took the lead with a combined time of 88:20.44.